RMH has named three nurses the first recipients of the Excellence in Nursing Practice awards—Eliza Burkholder, RN, 5 West; Eileen Phillips, RN, Pre-/Post-Surgical Care; and Gina Yost, RN, Information Systems. 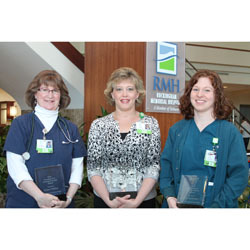 The RMH Nursing Division created the new Excellence in Nursing Practice Awards to recognize outstanding nurses. RMH nurses are nominated for the awards by their peers and selected by a committee of nursing leaders. Nominated nurses must demonstrate a passion for the nursing profession and exemplify excellence in mentoring, leadership and service. A total of 23 RMH nurses were nominated for the awards. One nurse is selected in each of three categories—inpatient, outpatient and a specialty role. Burkholder was awarded for excellence in an inpatient area, Phillips for excellence in an outpatient area, and Yost for excellence in a specialty role. The three nurses were recognized during National Nurses’ Week, May 6-12, for their efforts to promote and advance the nursing profession; for displaying caring and commitment to patients, families, and co-workers; and for demonstrating leadership in the nursing profession. Each recipient received an elegant, custom-designed plaque.